This assemblage of found objects might not be the epitome of ever-changing fashion and the desire to be beautiful. Rather, it is a whimsical portrayal of fashion trends. The model wears a combination of fashion statements. 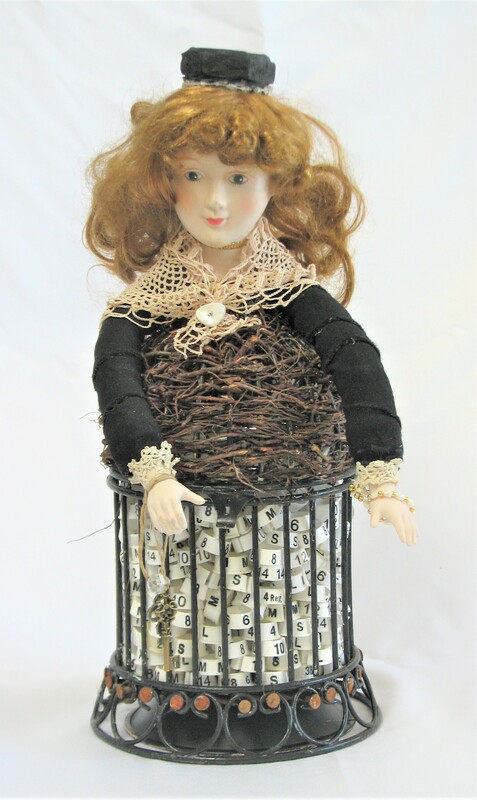 Her garment is a metal bird cage, while the bouffant blouse features a bodice woven from tree roots. A transparent pencil skirt filled with an assortment of size identification markers serves as a reminder of the importance society attaches to body image. The circumference of the skirt showcases metal (rusty nails). The model wears basic black and is adorned with lace. The ensemble is completed by a classic pillbox hat (a rusted nut). This assemblage is a joyful depiction of style as it comes and goes. It reminds us that true beauty comes from within. Beverly Pendlebury u… on Welcome! Martha Ponting's Pag… on Welcome!